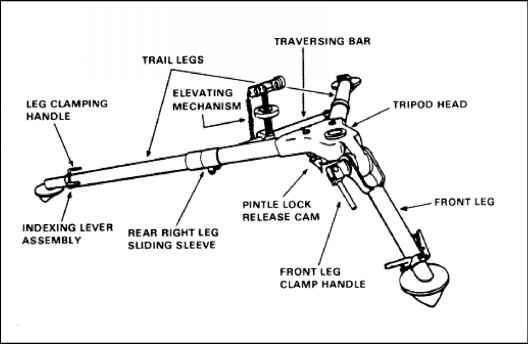 The sear assembly should be removed only in a clean and well-lit area because a small pin could possibly fall out and become lost, which makes the gun inoperable. (a) Raise the top cover assembly and push the secondary drive lever pivot post from the outside of the top cover assembly. (b) Separate the secondary drive lever from the top cover assembly (Figure 2-11). (c) Tap lightly on the secondary lever pivot post with any available tool, if necessary. Figure 2-11. 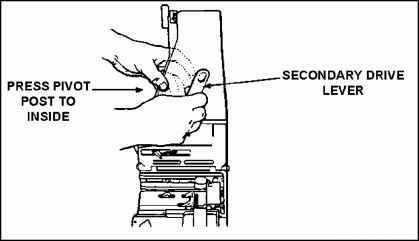 Secondary drive lever removal. 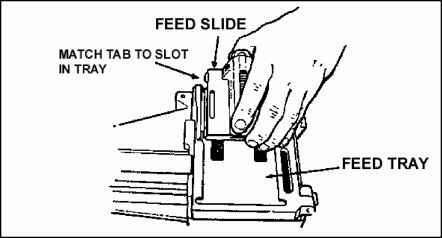 (d) Take the secondary drive lever from the slide assembly, and allow the feed slide and tray assembly to close. (a) Hold the top cover straight up with one hand. (b) Pull the top cover pins from both sides (Figure 2-12). (c) Lift the top cover assembly straight up and off. Figure 2-12. Top cover assembly. (a) Align the tabs on the feed slide with the slots in the feed tray and lift them straight up (Figure 2-13). Figure 2-13. Feed slide assembly. (b) Take out the feed tray by lifting it straight up (Figure 2-14). (a) Depress the tip of the alignment guide spring with the secondary drive lever or a cleaning rod section. (b) Slide the alignment guide out of the receiver by pulling the assembly slightly rearward (Figure 2-15). 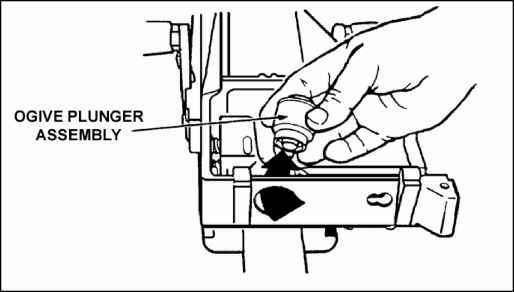 (6) Take out the ogive plunger by pulling it out through the inside wall of the receiver (Figure 2-16). (a) Push the round-positioning block into the side of the gun. (b) Slide the round-positioning block forward. (c) Release the round-positioning block forward from the keyslots in the receiver wall (Figure 2-17).